Is Krav Maga Hull the right class for me? Spartans Academy’s Krav Maga Hull classes are your #1 choice for Krav Maga training in Humberside, providing you with the opportunity to learn a world class self defence system under the guidance of highly experienced professional instructors. Our classes will boost your confidence, improve your physical fitness and enrich your social life. Join our Krav Maga Hull classes and you can expect to learn the knowledge and self defence techniques you need to keep yourself and your loved ones safe from harm, all in an environment which strikes the ideal balance between great fun and focused learning. Join our regular classes and you’ll meet new people, enjoy increased fitness levels, and most importantly, you’ll learn the world-beating Krav Maga system – as used by Israeli Special Forces. Train with us at Krav Maga Newcastle for a healthier body, an enriched social life and a safer future for you and your loved ones. What if I’ve never practiced martial arts before? That suits us perfectly! The movements involved in traditional martial arts do not necessarily fit in with the Krav Maga system, which often means newcomers to martial arts pick up Krav Maga quicker than experienced students of karate, judo and so on. Absolutely not! Krav Maga Hull caters for an extremely wide range of ages; our oldest member at present is over 80 years old, whilst our youngest students have just finished their GCSEs! Whether you’re a teenager or a pensioner, an experienced martial artist or a total self defence novice, our classes have a great deal to offer you. If you’re worried about your fitness level, you only have more to gain from our classes! Krav Maga is a brilliant way to get back in shape, working all the muscle groups with a combination of aerobic and anaerobic exercises. Our Chief Instructor Gheorghe Husar plans our sessions in minute detail to ensure they will help you tone your body and shed some pounds while you learn, regardless of how fit you are in the first place. 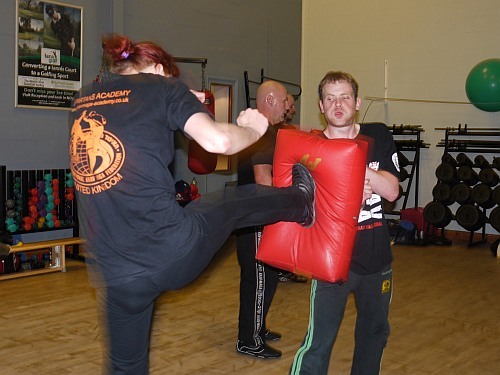 Krav Maga has been scientifically proven to burn more calories than running, swimming and cycling, which makes it a fantastic way to improve your fitness whilst you acquire new skills. Will I fit in at Krav Maga Hull? Krav Maga exists to empower all kinds of people, irrespective of their gender, build and background. We’re proud to say with confidence that Krav Maga Hull embodies this ethos, providing a welcoming environment and effective tuition for all. If you’re still doubtful, we’d like to invite you to come and experience one of our 2-hour classes, totally free of charge – you’ll never look back! It’s not just our expertise that makes us the best teachers of Krav Maga Hull has to offer; it’s the warm welcome you’ll receive at our classes too. Click here for more info. What if I don’t like to fight? Krav Maga teaches us to use aggressive actions only in self defence. This is not a system for people who want to fight; it’s for people who want to be able to stand up for themselves if they absolutely have to. The Krav Maga Hull team will develop your fighting fitness and endurance to empower you with the ability to neutralise threats in an effective and responsible manner. But bad things never happen to me! If that is the case, we’re very happy for you! Unfortunately, there’s no telling who will or will not face violent threats in their life. Krav Maga will teach you how to respond if you’re one of the unlucky ones. Just two hours of Krav Maga practice reduce your chances of falling victim to a sexual assault. In our opinion, that’s two hours well spent.